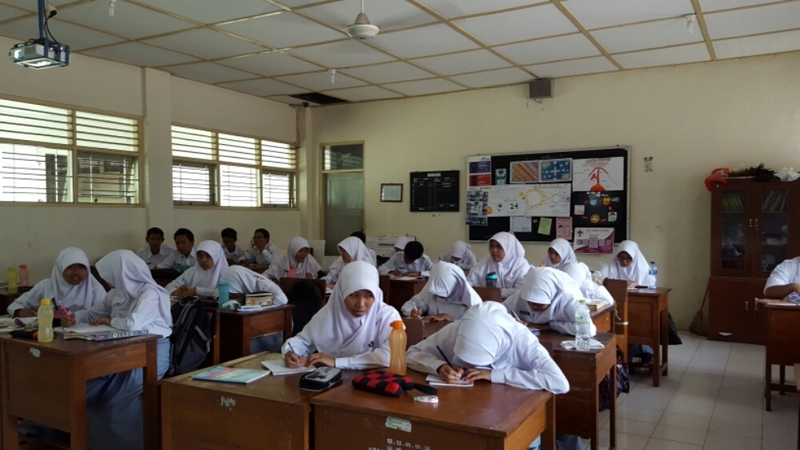 I am well into the second semester of the Indonesian school year, and teaching is still the heaviest occupant of my thoughts every day. Did they enjoy today’s lesson? Are they learning something meaningful? Do they understand what I’m trying to do? Do they look forward to English class? DO THEY LIKE ME? It is already almost April (7 months passed like a bullet), and I am now in the home stretch of the grant. 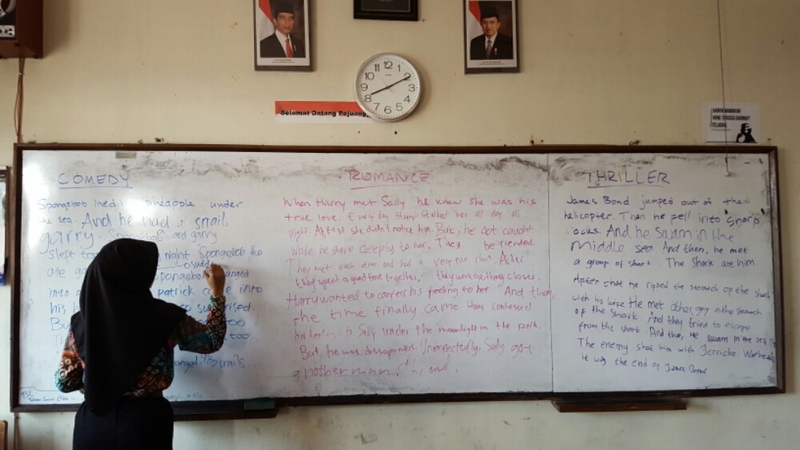 Teaching the 10th grade students at SMAN1 has been the most creatively challenging, physically exhausting, fret-inducing, and just all-around fascinating learning experience I have ever embarked on, and I wanted to use this post to share some of the adventures I have had with my students in the last seven months. An oddly specific lesson topic, but sometimes specific makes it easier to lesson plan. Out of all the possible things they could be learning about the English language, I’m not sure focusing on how to congratulate someone is the most practically useful, but nevertheless this remains one of my favorite lessons of all-time. Then we jumped straight into Jeopardy. There’s a theory that the way teachers teach is completely shaped by the way that we learned when we were students, and if there’s anything I remember about being a student it was playing Jeopardy in AP Biology class. I don’t think I realized back then how cool of a teacher Mr. Jones was for having slides that said “Baba Ganoush” after you answered questions correctly about the Krebs cycle. Jeopardy is quite possibly one of the most versatile teaching tools…. In AP Bio we used it for review. In this lesson, I used it to introduce different expressions of congratulations. The students were divided into two teams and the teams chose from categories like “Family” or “School.” Then I read an example of a congratulatory expression out loud. Example, “Family for 300” would be “Congratulations on your new baby boy!” and if students could guess the real life situation that corresponded to that expression, they would get 300 points. Later in the game, I sometimes gave the situation and asked for an expression to see if they picked up on some of the new expressions. Jeopardy worked wonders because it was a listening activity that came with the excitement of a game show, and it put competitive pressure on my otherwise very shy students. So, they were raising their hands like lightning before they could even remember that they were shy. It was also a way for me to show them all the different ways to congratulate someone in various situations without having to do the traditional white-board/take notes method. We’ve been taught in teacher trainings that generally, after presenting new material, a lesson should progress to having students practice and then ultimately produce the material independently (formally called the PPP method of lesson planning for Present, Practice, and Produce). For the practice portion of this lesson, my co-teacher and I had students pair up, and we gave each pair a picture ranging from sports tournaments to wedding anniversaries. One partner had to come up with an achievement based on the picture and the other partner would congratulate them accordingly. I’m a huge fan of using pictures in class because it gives students somewhere to start, but it forces them to think of their own vocabulary. 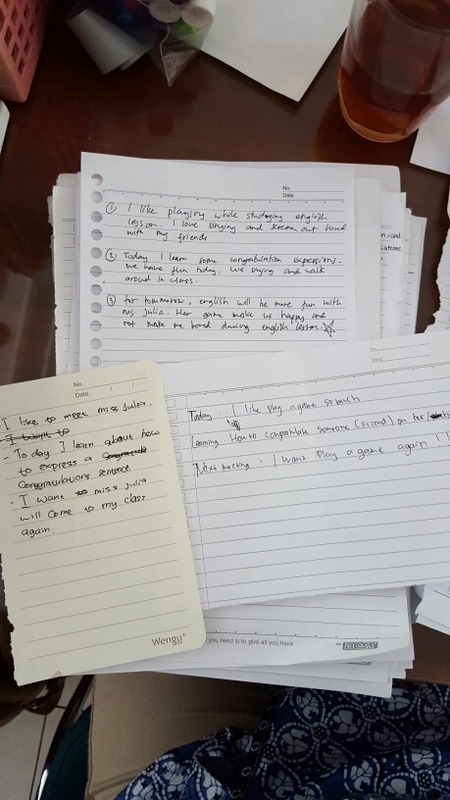 The final part of the lesson consisted of one of my favorite activities of all-time – it’s a game I made up to try and get the students conversing with each other without thinking too much about it. I put on some music and told the students to wander around the classroom. When the music stopped, students would have to grab the nearest person and strike up a conversation – telling their partner one of their own personal achievements, and their partner would congratulate them and continue the conversation. This game had the thrill of musical chairs and the candidness of spontaneous conversation. The excitement of scrambling for a partner was great for fueling enthusiastic conversation without them realizing it. It’ll be a long time before I forget the image of my students parading around the classroom like a train, hands on each others shoulders, a marching chorus of Maroon 5 that would scatter into a million squeals at the touch of the pause button. Exit tickets are kind of a guilty pleasure for me because afterwards I feel like all of my students just wrote me private notes. But they’re also great because I am always wondering what they’re thinking. 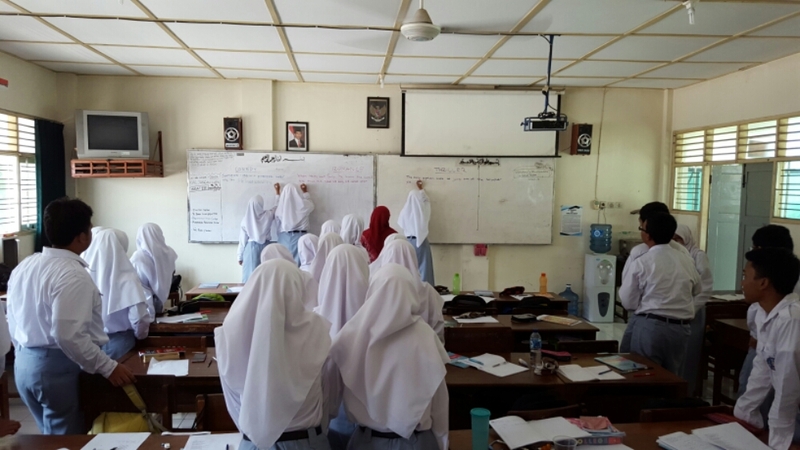 I think for the most part, this was the first time they ever played games like that in English class – the first time they ever had pop music in class, and the first time they were asked to get out of their seats and wander around the classroom. 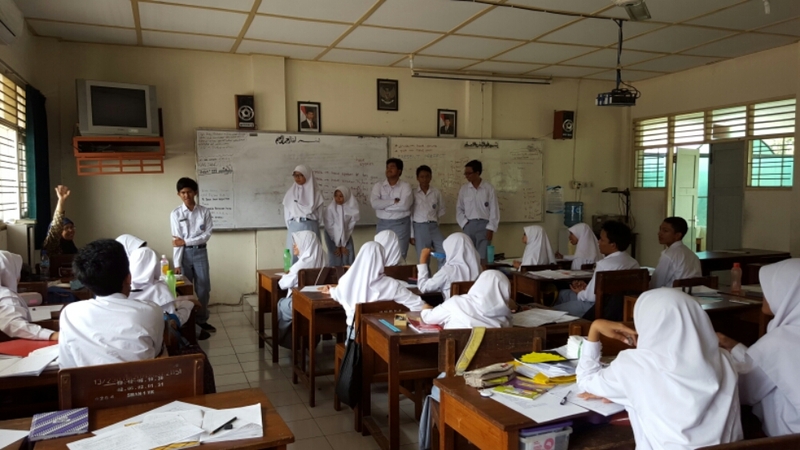 For this activity, there were five students in the front of the room, who were potential suspects in our detective investigation. Another student would silently choose one of the five to be the “suspect.” The rest of the class could ask questions like “does your suspect have glasses?” or “is your suspect wearing a watch?” and based on the yes or no answers, the class would guess which individual the student had picked. This activity was actually intended to be done with a picture of five different characters on the projector, but in one of the classes the projector wasn’t working. My co-teacher asked if we should scrap the whole activity, but I glanced around the classroom, picked five students that looked different enough, and we improvised by using real people instead. A skill that is absolutely essential to teaching: being resilient, flexible, and able to improvise (creatively) on the spot. One of the really endearing highlights of this lesson, though, was how many students wanted to go to Mecca and complete the Hajj. I really love when I get a glimpse of my students’ spirituality in class. A couple of weeks before that I was reading essays of many students who admired their mothers for never missing a prayer. Skits were a great way to get a glimpse of students’ personalities. One of the topics last semester was “announcements” which I thought was an extremely boring topic (the national curriculum can be as strangely specific as announcements are one week and as vague as recount text are the another week), but it was made infinitely better with acting. I typed up situations in which announcements are relevant, like “you just saw a flyer for a local concert and you want to tell your friends about it” or “you just saw an advertisement on the internet about a tourism package and you want to convince your parents to go,” and asked students to come up with skits that would act out the scenario and include all the components of an announcement. These turned out to be absolutely delightful, and most of the time downright hilarious. 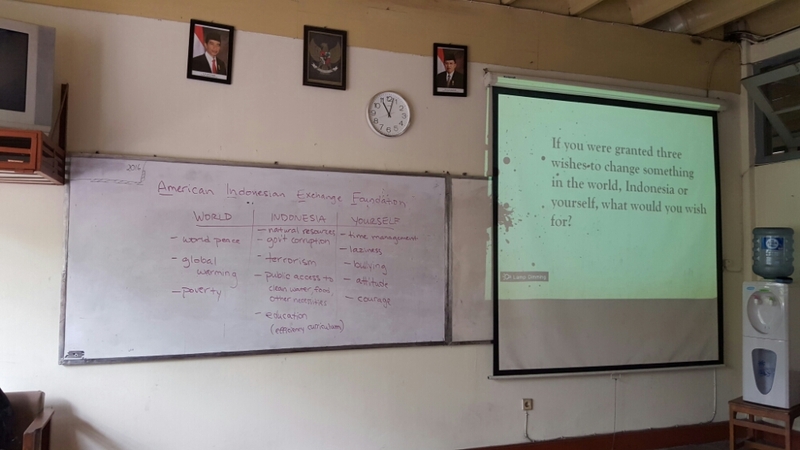 Aditra, speaking in the picture above, even broke down which airline you would take based on what economic class you belonged to. 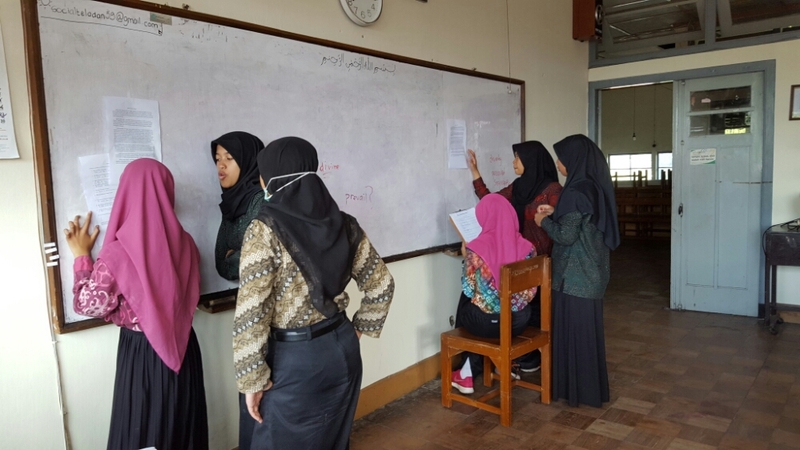 Before the second semester began, all 34 ETAs flew to Jakarta for a mid-year conference during which we received some really practically relevant training from English Language Fellows in Indonesia (very qualified English teachers from America teaching ESL abroad). The conference came at a great time – we all had a semester of teaching successes and challenges under our belts and we were all looking for some new inspiration for the new semester. My own personal takeaway from the abundance of advice and direction we received at the mid-year conference was when one of the language fellows ended her presentation with some real talk. We could carry out our lessons about the English language talking about Sally and David in the park, or we could take the opportunity to incorporate global issues into our examples by reading passages and teaching students meaningful things while they learn a new language. 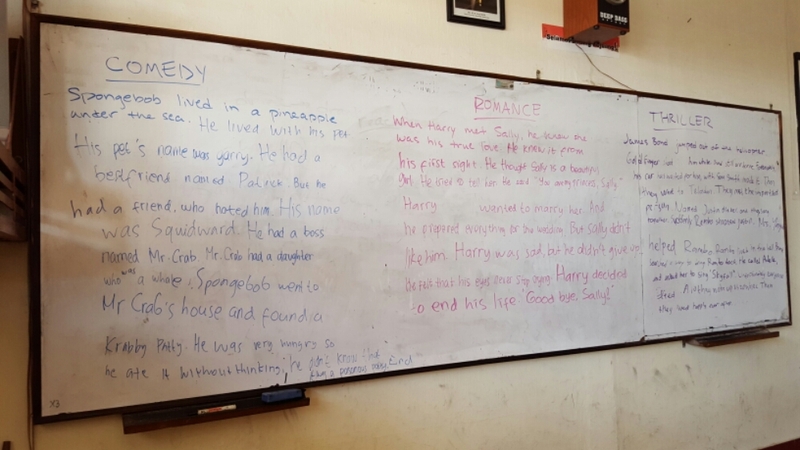 It was basically group reading comprehension on the wall, but it’s incredible how just the slightest switch-up can make a boring activity much more fun. The simple action of taping the biographies on the walls made students view this activity as something new–something different from an ordinary bland reading exercise–and having the paper on the wall turned out to be much easier for the students to read together at the same time, which I realized they wouldn’t be able to do if they were sitting down and reading at their desks and spinning the paper around until everyone could get a turn to look at it. 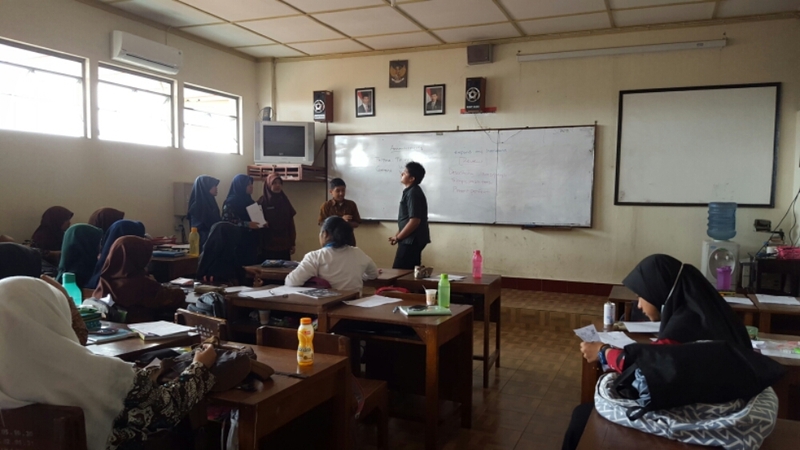 Every year, the Indonesia ETAs hold local English Speech Competitions at their schools, called the WORDS competition. 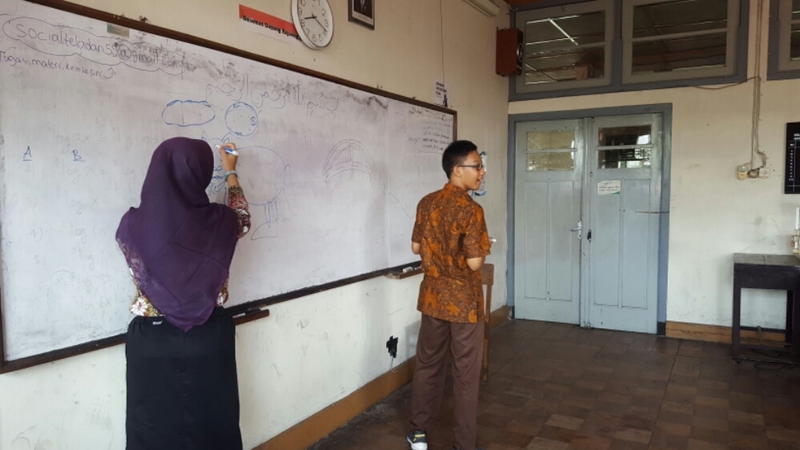 It’s a creative English speech competition that gives students the freedom to incorporate any talents (music, dance, poetry, acting, comedy, etc.) into their speech. 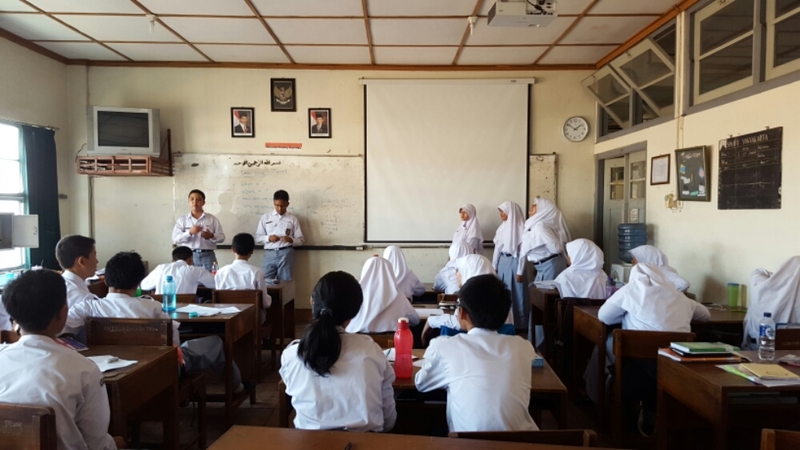 The winner from each local school travels to Jakarta courtesy of the American Indonesian Exchange Foundation (AMINEF) to deliver their speech alongside winners from every other ETA’s school in the national WORDS competition. Some ideas were derived from recent news, like ISIS and terrorism. 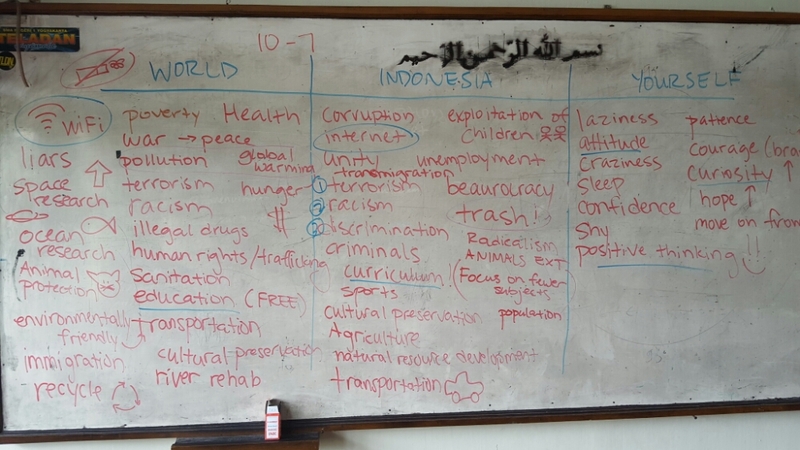 Some ideas were fueled by personal experiences, like the Indonesian curriculum or bullying. Others sprang from personal interests, like space research, and others came from places of impressively deep thought and global awareness, like the public perception of Muslims, or perceptions of beauty. 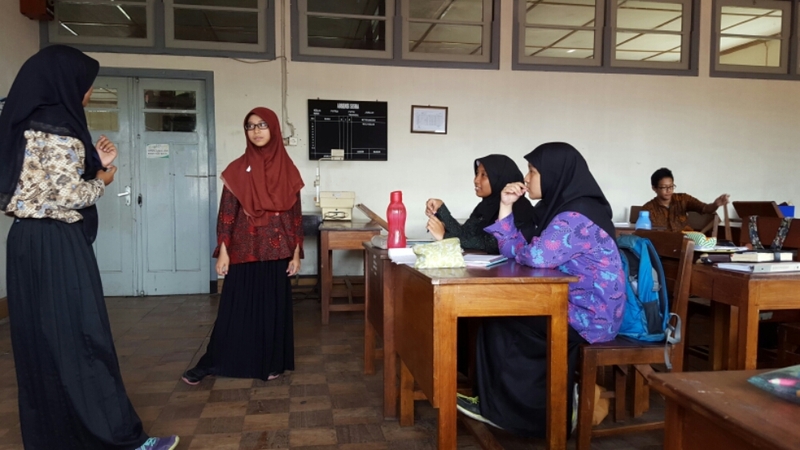 I am not a certified teacher, and I have not had classroom teaching experience prior to coming to Indonesia. All I have is something close to resembling desperation for these students to have a good time in the classroom and for them to try new things. I would not be able to muster up the energy to try and move 300 students every week if it weren’t for the enthusiasm that my students reflect back. 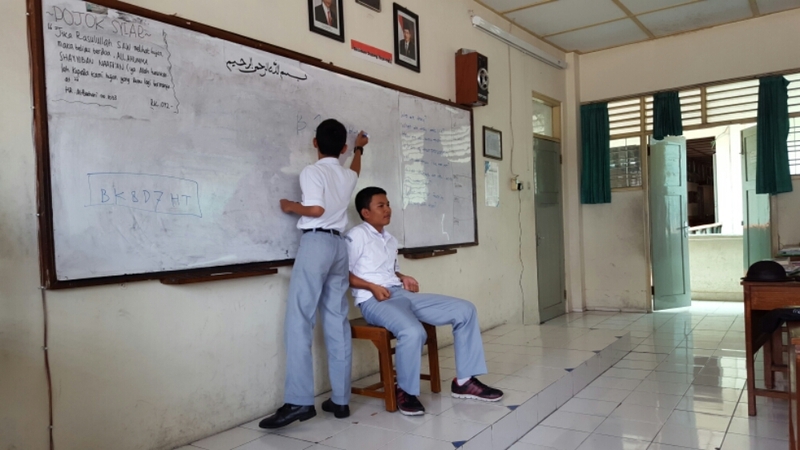 At the end of the day my teaching experiences in Indonesia have been positive by and large because of the open-mindedness of my co-teacher and the encouragement and support I get from the classroom successes of the students of SMAN1. Their willingness to hear me out, to blurt out their thoughts, and to try new things with me is what gets me to splash cold water on my face every morning and speed off to school on my motorbike at 7am.